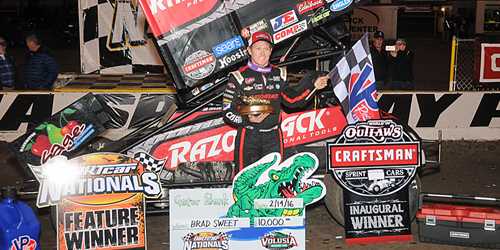 Lonnie Wheatley, BARBERVILLE, Fla. (February 14, 2016) – It was very nearly a perfect opening World of Outlaws Craftsman Sprint Car Series weekend for Brad Sweet. After winning Friday night’s WoO opener at Volusia Speedway Park’s DIRTcar Nationals and then running second to Donny Schatz on Saturday night, the Grass Valley, CA, native picked off his second win of the weekend by racing to victory lane in Sunday night’s 30-lapper atop the ½-mile clay oval. The triumph also gave Sweet the DIRTcar Nationals title aboard the Kasey Kahne Racing Razor-back Professional Tools No. 49. On this night, all that stopped Sweet from a clean sweep was a second-place run to Joey Saldana in the Dash. After teammate Daryn Pittman set quick time the previous two nights, Sweet set Sunday’s standard to give the KKR duo a sweep of Fast Times over the weekend. Sweet won his heat race handily but lost the opening lap duel to Saldana in the Dash. Following a pair of aborted feature starts, the first cautions of the night, Saldana again jumped into the lead and set the early pace. But, Sweet got the advantage on a lap ten restart and never looked back in a convincing drive to victory lane. After missing the feature cut on Saturday night, Posse shoe Lucas Wolfe bounced back by battling past Saldana over the closing stages of the feature to capture runner-up honors. Saldana settled for third with David Gravel and Greg Hodnett rounding out the top five. Quick Time: Brad Sweet stopped the clocks at 12.913 seconds to snap Daryn Pittman’s run of two consecutive quick times in a row. Heat Winners (starting position in parentheses): Brad Sweet (1), Joey Saldana (1), David Gravel (2). Heat Moments: Caution-free heats, David Gravel turned the quickest lap of the entire week with a circuit of 12.853 seconds in the third heat; Clyde Knipp narrowly avoided being lapped in his heat race, a marked improvement over being lapped half way through his Friday night heat race; Jason Johnson’s move from eighth to sixth in the opening pair of corners of the third heat was the only pass of note. Dash Winner (starting position in parentheses): Joey Saldana (2). Dash Moments: All Saldana all six laps. “B” Main Winner (starting position in parentheses): Austin McCarl (2). “B” Main Moments: All A-Mac all 12 laps; Bryan Clauson scratched after also blowing an engine in hot laps. Original Start – Daryn Pittman spins to a stop on the frontstretch, the KKR crew swaps out a front axle in the allotted two-minute work area time to get Pittman back in on the action. Second Start – Doug Esh gets upside down exiting turn four coming towards the green flag. Esh goes to the work area but retires while Greg Wilson and Danny Lasoski both return to action after checking in at the work area as well. Lap 9 – Greg Wilson comes to a stop on the frontstretch. It was the second chance Sweet was looking for. “A” Main Hard Charger: Jason Johnson advanced six positions from 18th to 12th on a fast track that offered few passing opportunities all night long. A-Main – (30 Laps) – 1. 49-Brad Sweet ; 2. 1Z-Lucas Wolfe ; 3. 83-Joey Saldana ; 4. 5-David Gravel ; 5. 27-Greg Hodnett ; 6. 1-Sammy Swindell ; 7. 2-Shane Stewart ; 8. 15-Donny Schatz ; 9. 71M-Dave Blaney ; 10. 1B-Dale Blaney ; 11. 29-Kerry Madsen ; 12. 41-Jason Johnson ; 13. 7-Paul McMahan ; 14. 1S-Logan Schuchart ; 15. 7S-Jason Sides ; 16. 11K-Kraig Kinser ; 17. 24-Terry McCarl ; 18. 9-Daryn Pittman ; 19. 59-Austin McCarl ; 20. 2L-Danny Lasoski ; 21. W20-Greg Wilson ; 22. 1A-Jacob Allen ; 23. 10H-Chad Kemenah ; 24. O7-Doug Esh . Lap Leaders: Joey Saldana 1-9, Brad Sweet 10-30.